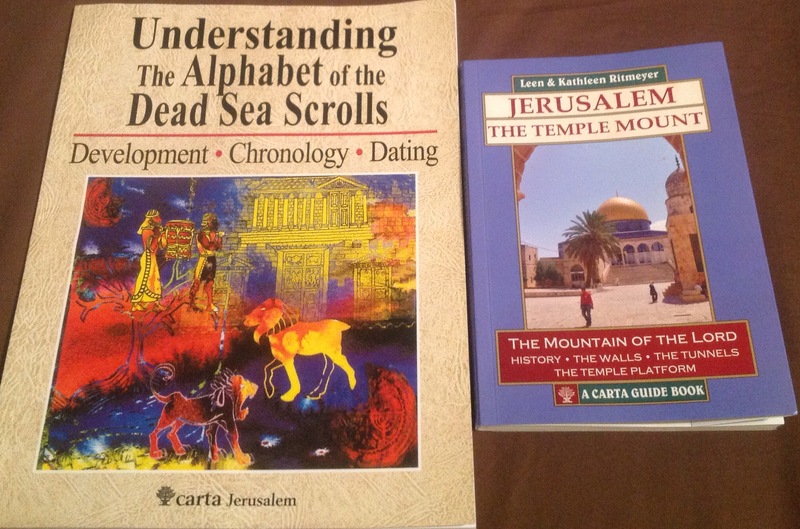 It is always exciting to see what new releases Carta Jerusalem has out. Here are two–one on a technical subject and another that makes for great history and touring. Dr. Yardeni is one of the world’s leading authorities on Hebrew paleography, or the study of Hebrew handwriting. In this short, but profusely illustrated volume, she reviews the Dead Sea Scrolls to evaluate the development of the handwriting with an eye to dating. Though that is not my field, you can see a distinct evolution of the texts in the samples she provides. If you are studying this subject, this title will be indispensable. She gives a page of hints that students will love at the end. This will likely be the definitive volume that will be all anyone would ever need. In a word, this book is incredible. It is small enough (160 pages) and has a durable enough cover to be easy to carry on your next visit to Jerusalem. Even if you don’t make it to Jerusalem in the near future, this book can enlighten you as an armchair traveler. It holds its own as a small reference volume on your shelves as well. The Ritmeyers are experts whose comments are trustworthy and well stated. (I am told they have other Carta titles that take this history farther). Add to that superb photos and those awesome Carta maps and you have a winner. The first chapter gives a succint history of the Temple Mount. Check out the illustration of Mt. Moriah before any building took place (page 13). With that map, later Temples are superimposed upon it that gives eye-opening perspective. The history comes down to modern times and is captivating. The other two chapters offer self-guided tours of outside the walls and upon the Temple Mount itself. I went to the Temple Mount a few years ago and loved it though I went along willy nilly; but I would so love to have had this book. It would have doubled what I got out of the visit. What better could I say about this volume? Don’t visit the Temple Mount without it!